Me and 2017 just got off on the wrong foot...a serious lack of Positive Mental Attitude from the off. I spent the year focusing on the negative things. On the things I didn't have rather than the things I do have. On the things that I had lost rather than the things I had gained. I had always threatened my "semi-retirement' from running this year, which meant less Team Hope events. Fortunately my lethargy towards the whole running concept has not deterred others, in fact perhaps, inadvertently, it has spurred them on. Many Team Hope members completed running events this year; 10k's, half marathons, marathons. Gaining achievements they never thought possible this time last year. I say "semi-retirement" because I had already entered two events before 2017 even started. Never say never. The Winter 10k was back in February and, putting my running hatred aside, I love this event. It gives you a fitness goal to get you through Christmas, it's lots of fun, it has a great medal and we make a weekend of it. Despite a slight hiccup with one of our restaurant bookings (I said table for 20, they heard table for 6!) there were many highlights over the whole weekend. We had a team of 20 entered this year, which was fantastic. We had first timers, PBs and even our very own heroine, Bridget the paramedic, who saved a life on the way round! The discovery of a fantastic pub on the South Bank with food and wine that really "hit the spot" after the run rounded off a fab weekend. And yes the food was one of the biggest highlights. We'll be back there again in February 2018 for what will be my 4th time and really looking forward to it. Always a highlight in the Hope Fitness calendar. Our active spring social was bowling this time. Overall winner was Sheetal. It's always the quiet ones you have to watch and this winner has a deadly competitive streak in her! One thing that I'm very proud of this year is that Team Hope has become very diverse. During the early days of Hope Fitness, the members were predominantly mums with primary school age children...so just like me really. But towards the end and throughout 2017 we have built up an eclectic mix of members, as stated by one of my favourites in a Christmas card, "that somehow works". Metafit has helped encourage some younger members into the fold, the youngest on the books is 15. Me, a past-her-best-over-the-hill-40 year old, encouraging members who are 25 years my junior...who'd have thought!! We also have men...yes MEN! We have four regular members of the male variety on the books, which only enhances the dynamics of the group. This diversity not only makes Hope Fitness what it is but also keeps me on my toes! We have had one Hope Junior baby, Alfie, who I had the pleasure of meeting and having a little cuddle with just last weekend at a Team Hope wedding - congratulations to Ally. Mum Emma continued with Metafit until she was 37 weeks pregnant and I'm sure it won't be long before she's back with us! Next year we will be welcoming our first set of Hope Junior twins...how exciting! I always like to throw in a few themed workouts throughout the year; Valentines, Halloween and Christmas just a couple to mention. Everyone's happy to get involved with the silly games but I have to specifically mention Amanda and Sue who are always up for dressing up, particularly at Halloween. Had a slight disaster for this workout this year in that Tesco didn't have any pumpkins left on Halloween itself. Therefore I was left to improvise with a med ball and a sharpie! 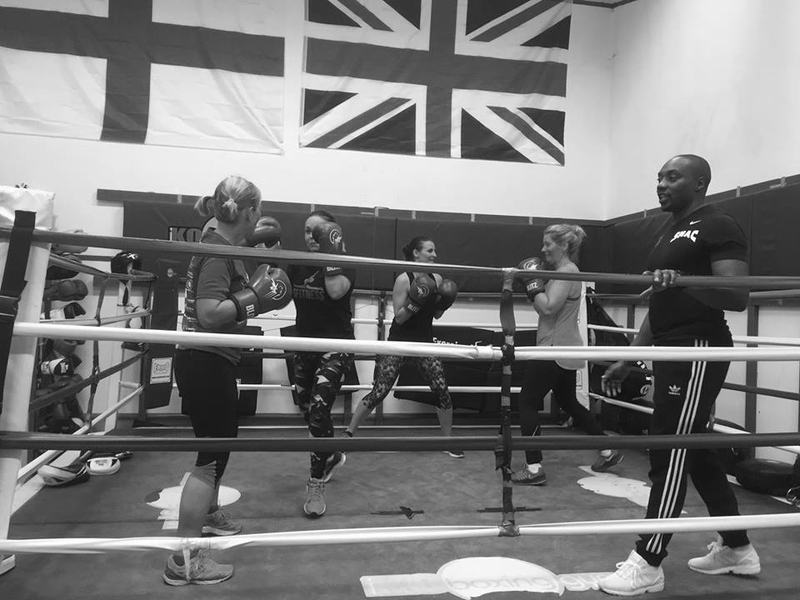 A group of us were lucky enough to be invited to Ipswich Boxing Club for a session with some of the coaches. It certainly got us out of the comfortable bubble that is Hope Fitness and even I participated. Don't think I have ever sweated so much in my life! It was great fun and something I would quite like to take forward with Hope Fitness. The Hope Fitness Summer Challenge was back for the third summer in a row and more people than ever took part, and more of those people saw the challenge through to the bitter end. It never fails to amaze me how much love and hatred there is for this challenge in equal measures. My goal: to inspire people to be active during the notorious summer holiday downtime, to encourage some healthy competition and raise the profile of Hope Fitness all in one #hopefitnesssummerchallenge package. There is always at least one person who gets really on it and blows away the competition. And there is always at least one person who moans that said winners are being creative with their points tally. Sarah was the ultimate winner this year, closely followed by Jo. Every year I refine the rules to make it more challenging and more competitive. 2018 will be no exception. My biggest highlight of 2017 was the Hope Fitness weekend retreat. After the success of the London weekends away over the last two years I was inspired to organise another weekend away but this time a fitness retreat. Much stress and hard work went into arranging this but the result was very rewarding. A fun, fabulous and faultless weekend. You can read more about that here... The weekend was such a success that we had a 100% rebooking rate for 2018 and filled all the additional places within 3 weeks! Every year I promise myself that I am actually going to train for the whole hog obstacle run and every year this event takes me by surprise and another year passes when I just "wing it". I do this event every year and generally I love it, although ask my team and they will tell you I had some sort of breakdown/malfunction during the run this year. It's always muddy, it's always cold and it's always fun! Maybe 2018 will be my year?? I almost forgot...there was another Team Hope event this year...the Inflatable Santa 5k. Mainly for Hope Juniors (although I think the Hope Seniors enjoyed it more!) This event marked the start of the festive period and despite the cold, damp weather and distinct lack of mince pies, it is always great fun. For me it wasn't strictly 5km, Leo (big Hope Junior) and Holly (little Hope junior) positively encouraged me to take some shortcuts. I totally blame them for leading me astray, it was all their fault! Everyone loves a party so no surprise that the annual HF Christmas Party has made it on to the list of highlights. We stayed on home turf this year and we are incredibly lucky to have the Hangar at Kesgrave Hall on our doorstep. A fabulous venue, great food, good music and most important of all, the best company. I still haven't forgiven those young scamps for forcing me to have shots!! The year was rounded off with a more low-key gathering at the Millennium Jubilee Hall. Just like last year the members casted their votes in a number of member award categories. Congratulations go to Paula for winning member of the year 2017. So that was last year but what about 2018? To be honest I have absolutely no idea! I find that Hope Fitness begins 2018 at a crossroads. At the moment I can't really see beyond next week. On one hand, Hope Fitness has some really solid foundations, a vast and diverse range of clients, an extensive timetable and a loyal and supportive inner sanctum. However, towards the end of 2017 it feels like Hope Fitness has lost its way and is meandering into the New Year without focus, in desperate need of an injection of...I don't know...something. But before you think that 2018 is heading in the same direction as 2017 don't forget what I said at the start of my post....Positive Mental Attitude. Hope Fitness celebrates 10 years in business next year so we have been through this cycle before. There's only one way to go. I just don't know what that is yet.